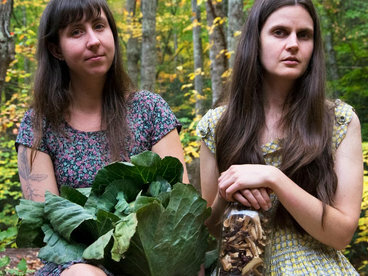 4* Review from The Telegraph and inclusion in their Top Folk Albums of 2015 ! Recommendation from The Sunday Times in their Culture section. 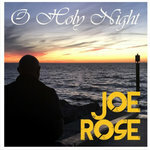 As played on BBC Radio 2, Radio 3 and BBC 6 Music, as well as many other wonderful independent radio shows. 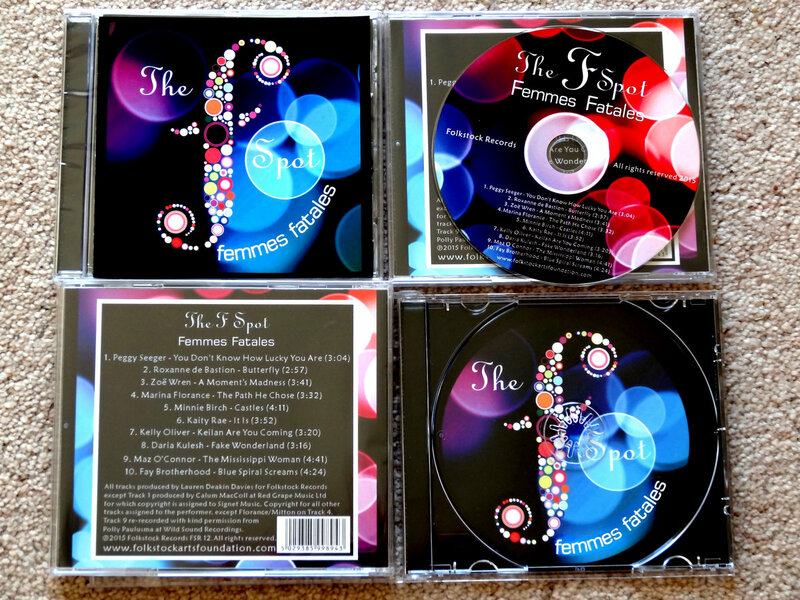 Beautiful artwork from Amy Pettingill creates a four page booklet for this jewel case presentation cd. Includes unlimited streaming of The F Spot Femmes Fatales via the free Bandcamp app, plus high-quality download in MP3, FLAC and more. 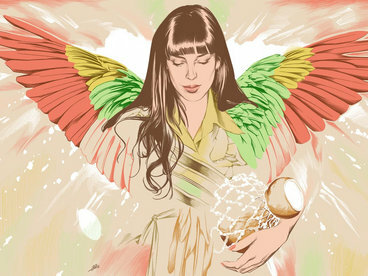 "It is reported that only 13 per cent of songs registered with the Performing Right Society are by women songwriters. 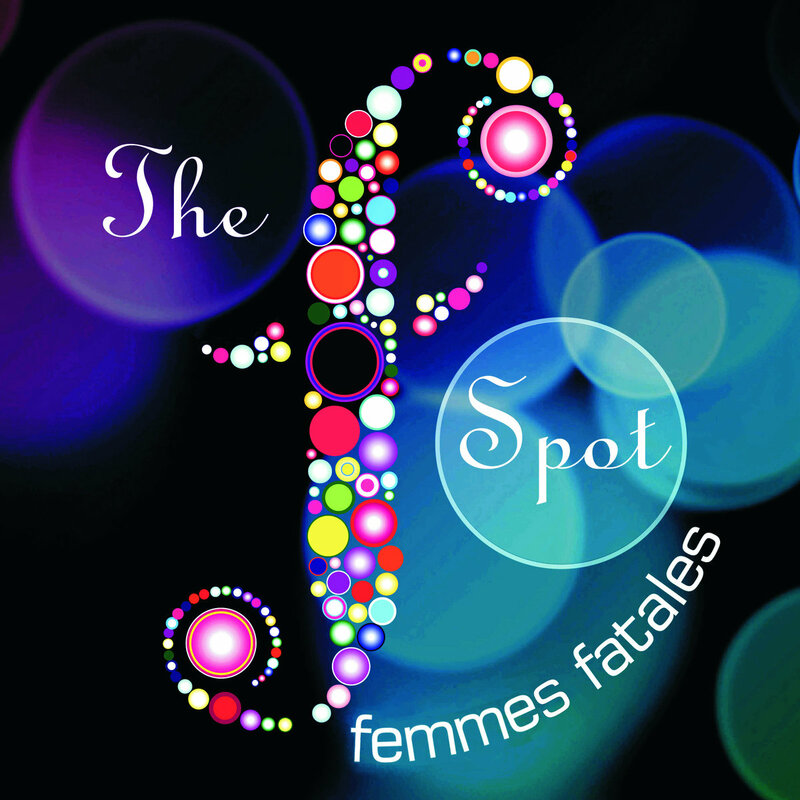 Which makes The F Spot both a statement of intent and a welcome piece of music. 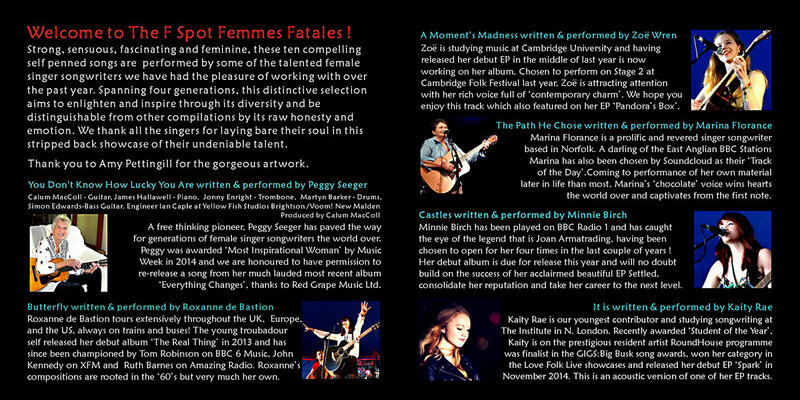 There are 10 songs by 10 different 'femmes fatales' and they are of a consistently high standard, whether from a trailblazer such as Peggy Seeger (Don't You Know How Lucky You Are) or a young London student called Kaity Rae (It Is). 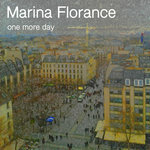 I liked the anti-war song from Norfolk's Marina Florance but there is much to enjoy in a variety of styles and approaches from Daria Kulesh, Fay Brotherhood, Minnie Birch and Zoë Wren. All the tracks are produced by Lauren Deakin Davies (except for Seeger's, which was produced by Calum MacColl) and there is an original album artwork from Amy Pettingill. 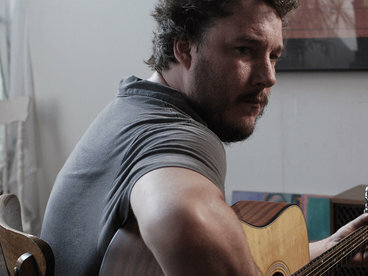 “It may be a small operation, but British label Folkstock has become shop window for an impressive roster of youthful singer songwriters who roam far beyond the borders of the traditional repertoire. Tom Robinson live on BBC 6 Music. 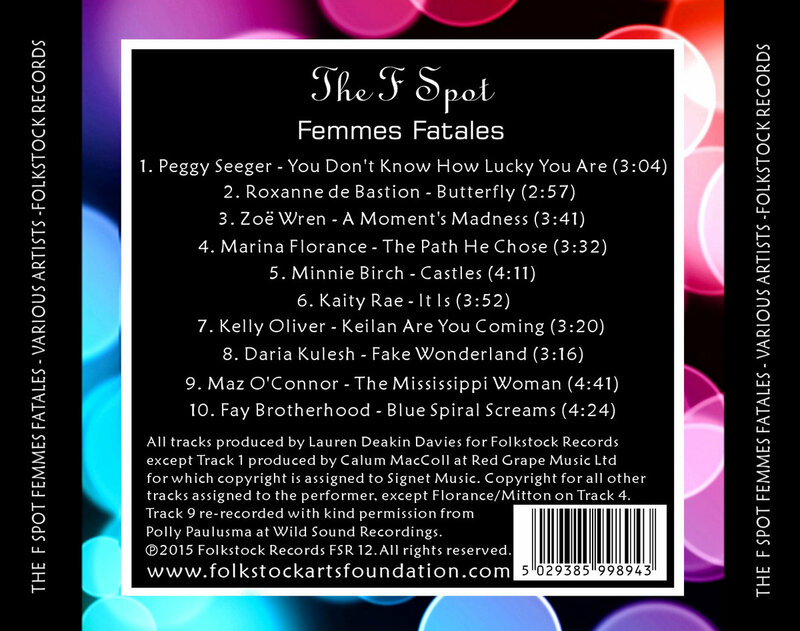 “as promised, the latest release from Folkstock Records features nine exclusive songs by female songwriters associated with the label plus the tune we are about to hear....it begins with this belter from Peggy Seeger ...it’s there to bang the drum a bit, because women are massively under represented in the music industry.. it’s quite hard.. there is a big glass ceiling so Helen Meissner from Folkstock, bless her, is doing something about it and she suggested that we should celebrate International Women’s Day when her record comes out and I think that’s a great idea, so that’s is exactly what we are going to do. Folk music is unlike Coca-Cola. Folk has many flavours which many can appreciate, unlike the one (maybe two)varieties that most people love of coke and the other brands which the rest of the people suffer with and pretend to enjoy. It is these varieties of folk: the songstress in the smoky bar, the high tones of the dancing maiden, and the gravel-chewing character who has worked everywhere and felt he has got nowhere, that make folk a good life companion. 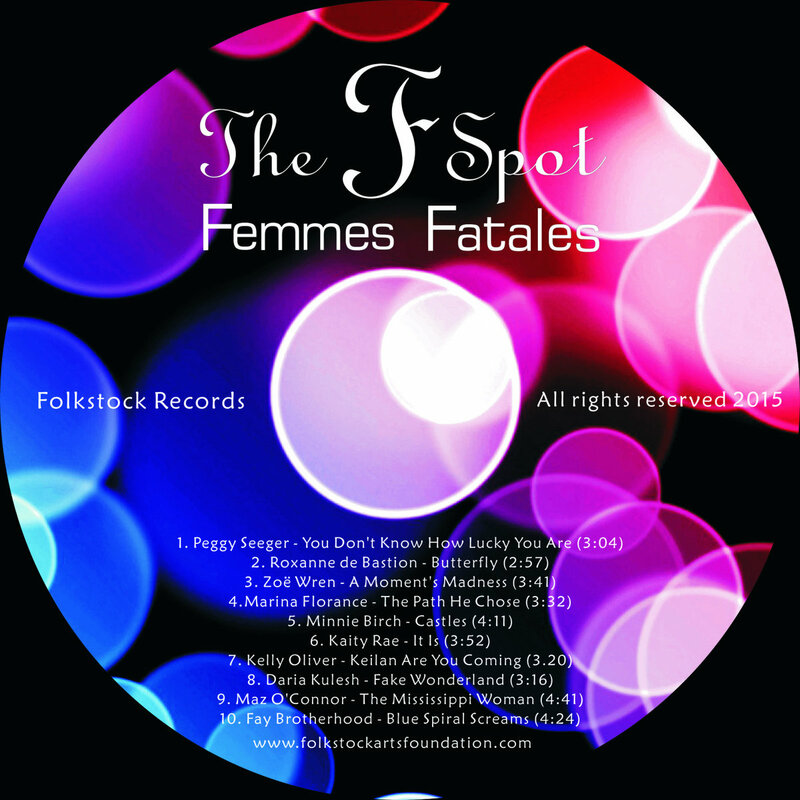 Variety is always good, and that is why for a change I've decided to have a look at The F Sport Femmes Fatales, a compilation album put together by FolkStock Records. It was first released in March 2015 but is due a reconsideration ahead of the exciting "London Folk & Roots" Festival where several of the artists will be playing. Folkstock came out of some excellent work that Helen Meissner did as a development project showcasing 77 artists and helped create a new scene and a co-operative for independent musicians to share ideas and publicise albums within. 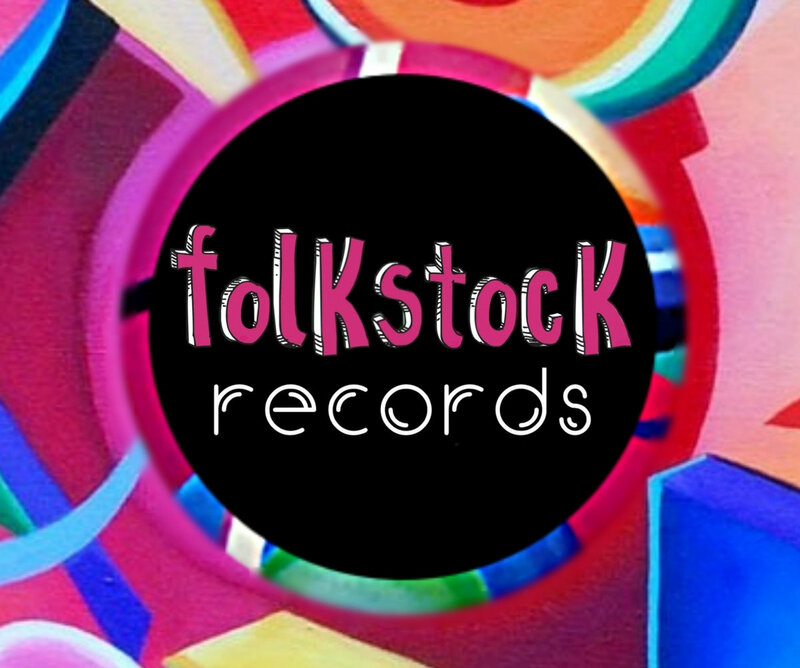 It is a fairly new festival but earnest in it's goals to foster and share the talents of diverse acts, and since Helen's daughter Lauren became involved in the music production, it has become Folkstock Records a label it's own right. The festival made it into the finals of the UK Festival Awards in 2013 for "Best New Festival" and Folkstock Arts Foundation was a finalist for the Best Community Company award too, so worth a look. Of course, Folkstock is blessed by having the legendary Peggy Seeger and Dave Swarbrick as their patrons. 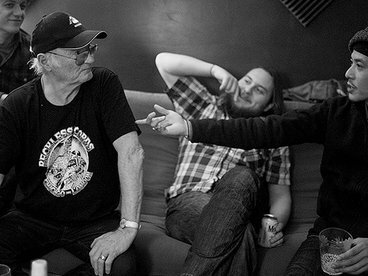 Swarbrick sees the importance of young artists having a role model and guiding figure on the path into music, "In my younger days the then scene was blessed with the like of Joe Boyd, Helen has picked up where Joe left off." It is hard to disagree, television and media make fame attractive to younger people. These successful artists are shaping a community and encouragement particularly in a time which seems extremely harsh to the prospects of young people. "Femmes Fatales" is opened by a veteran performer, Peggy Seeger, with "You Don’t Know How Lucky You Are" and who brings a certain gravitas to the recording, letting you know that this is going to be an album that is rich on purpose and that the artists aren’t just hear because of gender, they are all linked by being songwriters with something to say. 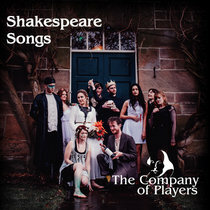 Some of the songs are more of a personal expression, whilst other songs touch on wider experiences bringing in subjects such as war and inequality of a damned sight more things than gender, such as social justice and striving for a society that is based on merit. 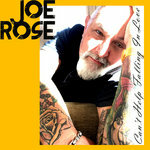 The things that the songs have in common, no matter the writing style and content is strength, that’s strength in both how the songs are put together as well as presented. 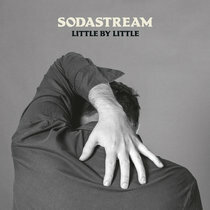 This is an album that celebrates standing up for and being yourself, no matter how much effort that takes. More importantly it does so in a way that not only makes you think, but also entertains. 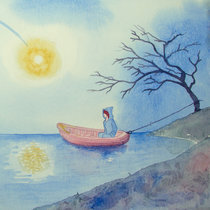 It’s very easy to relate to the themes and characters that are delivered by the ten artists on this compilation. You can see the mother looking wistfully at the photograph of her soldier son, the simplicity of faith overcoming the oppression of slavery and the suppression of cultures. 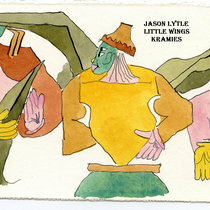 This is an album of tales and stories. It’s rich in symbols and high in inspiration, both absorbed by the performers and the way they’ve taken those influences and turned them into something special. 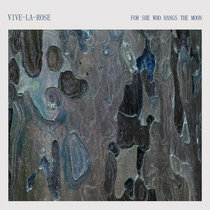 In someways I’d like to give you a track by track breakdown of the ten exceptional artists that make up this compilation, but the reality is, I’m just going to point you in the direction, it’s down to you to make the discoveries, all I’ll say is that it’s a journey well worth the effort". "Folkstock have pulled off quite a coup with the highly respected Peggy Seeger taking part..But then it's not entirely a surprise when you consider she was involved in their Armistice Pals album; the label is allying itself to International Women's Day and of course the tracks are all from femmes..There isn't a weak track on this album and if there is a better album around to encompass the ideals of IWD then it would be interesting to know what it is. 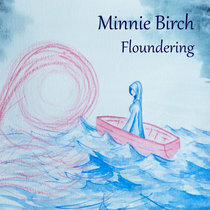 Strong, sensuous, fascinating and feminine, this compilation of ten compelling self penned songs from women is being released on Folkstock Records on International Womens' Day. 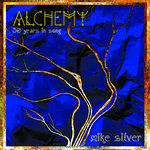 This is not just any album full to the brim with female singer songwriting talent. It’s been lovingly conceived, curated and produced to show many different aspects of the feminine psyche. 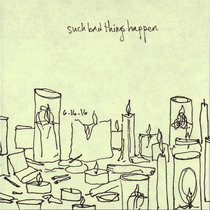 Lose yourself in the songs and let this album challenge your assumptions. And she said “lord, make a man out of me, lord, make a man out of me” capture your mind. Did you know that only 13% of songs registered with PRS are by female songwriters ? Let us smash these limiting statistics and inspire a generation of women. 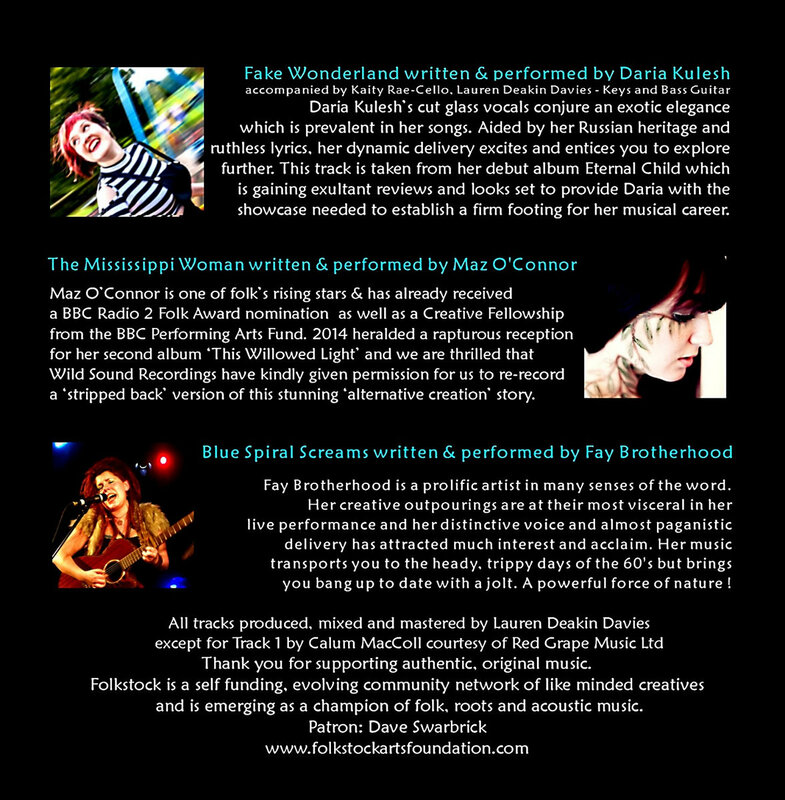 We hope that this distinctive selection of bright fresh female singer songwriters will enlighten and empower with its raw honesty and emotion. How can she not know I'd take care? How can she not know I'd be good for her? And she is furious. Because you always get there first. Just look around, who knew they’d build castles here? And just let it out that your princes fall for thimbles now. And we are furious. We wanted to be your undoing. And we are furious. Because you always get there first. That if you set alight to one then they’ll just all burn. Who knew they’d build castles here? You’ll watch your Princes fall for thimbles. There's a sound in the air tonight, as through the snow we tread. It's the sound of a crying boy, wanting his mama's bed. And his hands are shivering, and white from the cold, and his nose is red. 'Darling you're a big boy, and you're being good boy, we're almost home', she said. but Keilan, are you coming to me soon? Keilan can you hear me, Keilan can you hear me when I think of you? Keilan are you coming boy, I'm waiting for you. There's a sound in the shanty towns, as the sunlight burns the street. It's the sound of a laughing boy, with nothing upon his feet. Keilan can you hear me, Keilan are you listening when I think of you? Did you ever hear the tale of the Mississippi woman? “What is this river here? What is this naked shame? They'll never take our lands. They'll never see the dawn. Will fail - We'll not be owned! Silently we'll watch the God's and plan the time to strike! And we'll feed the crows your bones, or with honour we'll die! Blue spiral screams we charge! What will the battle bring? The turning of the Hare will tell our fate or fall. Come now brothers, kin and lovers! Our mother land will die.